Although rain dampened portions of the day, Petersburg’s sixth annual Bash in the Burg was held on schedule last Saturday, Aug. 9. Tents and portable carports housed most of the competing grillers; brews-wines-concoctions entries, and bread entries in the downtown park, where the tastings were held. 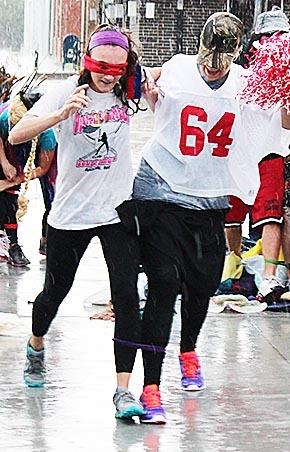 Five teams braved the rain for the first Bash Adventure Race held in the village park and downtown. Winning the competition was the team of Tye and Tammy Nolan, who excelled in wheelbarrow golf and the rope swing. Complete story and photos in the Aug. 13 Petersburg Press and Albion News Print & E-Editions.